On Monday I was still feeling fine and was looking forward to getting back to track. I got there and set off merrily on the first set of five of these: 300f, 100j, 400f, 100j, 300f. However after the second set I realised I was in fact completely knackered so the last 3 sets were much slower in the company of Pete who was taking it easy. Even though I couldn’t run as hard as I wished I was pleased to have got out and at least attempted the session. Tuesday was a planned rest day. Wednesday is my newly appointed long run day. As the half is now out of the way the long runs don’t really need to exceed 12 miles. Today I gathered up Rob for a nice slow easy run after the weekend’s exertions. It was very pleasant to jog along the seafront where not long ago we were charging at full speed. No effort expended this time. Around 11 miles at just under 9 minute mile pace. Perfect. In the evening it was off to work Run Club. This evening I had two attendees whom I wanted to do lamppost fartleks. However one was suffering calf trouble after having run the half so I jogged gently with her whilst my other lady fartlekked with gay abandon up and down the seafront. So this ended up as another nice easy jog of around 5 miles. Perfect post half double recovery day. Thursday was another well earnt rest day. 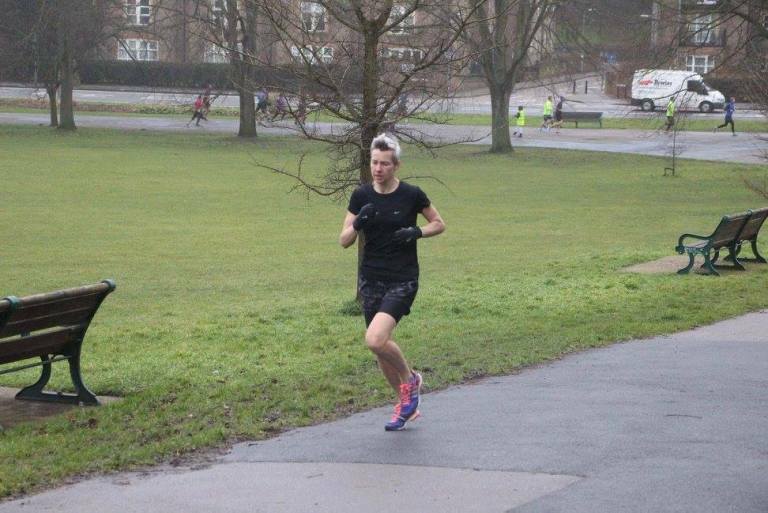 On Friday I wanted to try and ready my legs for an assault on sub 20 at Preston Park parkrun on Saturday so I took myself out for 6 x 1 minute fast sandwiched between two twenty minute steady runs. It was a little windy for 4 of the fast minutes but I went by effort anyway what with not having a GPS watch any more. Saturday dawned with some truly horrible weather. Really cold and windy and a horrible bone chilling drizzle. I was still determined to try though and this I duly did. To no avail alas. I was just tired from last Sunday which of course wasn’t surprising. I did try but it only led to 20.32. However this is about what I’ve been running recently so to do this in horrible conditions and just after a half must be a sign that when conditions are favourable I can get back sub 20 where I belong. Why don’t I ever look like I’m running? Many thanks to Mark for letting me use the photo! I finished off the week with climbing on Saturday afternoon. Having not been since before Christmas I had regained my fear of heights so had to spend a bit of time hyperventilating near the top before getting back into the swing of it. There shall be some achy arms ahoy in the next few days! 32 ish miles for the week.